Muramasa: The Demon Blade was released on September 8, 2009 with a MSRP of $49.99. The game was developed by Vanillaware, and published by Ignition Entertainment for its North American release. It received an ESRB rating of "Teen" with "Alcohol Refernce, Fantasy Violence, Suggestive Themes" listed as content for gamers and parents to be aware of. A portion of the description on Amazon.com says, "The creators of the acclaimed PlayStation 2 hit, Odin Sphere, return with the single player, action RPG, Muramasa: The Demon Blade. Steeped in the ancient mythology of Japan, Muramasa: The Demon Blade tells a tale of possessed souls, forgotten pasts and unimaginable destinies. A Wii exclusive, filled with expertly hand animate graphics and gameplay that transitions seamlessly between player-controlled elements and story sequences it is an adventure only to be experienced on the Wii." 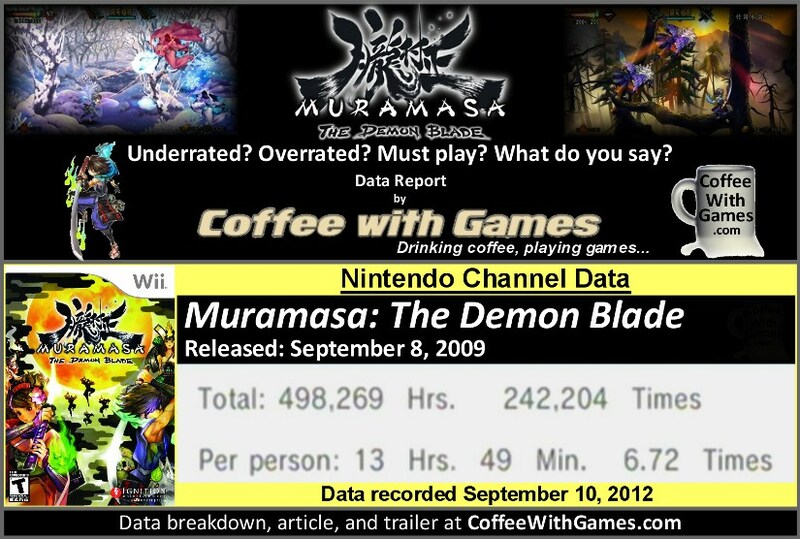 How many hours have U.S. Wii owners reported playing Muramasa: The Demon Blade since it released just over 3 years ago? Brew yourself some coffee, and let's take a look! 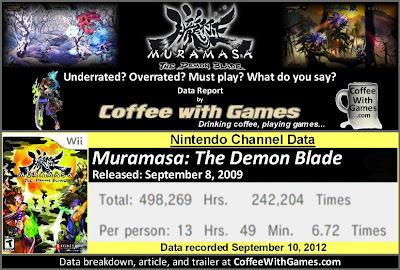 Muramasa has approximately 36,042 U.S. Wii owners that have reported game-play hours through the Nintendo Channel, now with 1,098 days possibly reported. The game has about 31,453 more Wii owners that have reported data since the first report on the game. The Demon Blade's play-time per day/session is 2 Hours 3 Minutes, and the overall reported average is 13 Hours 49 Minutes as the image above shows. The reported 498,269 Total Hours of game-play is an increase of 444,760 Total Hours since the first report. 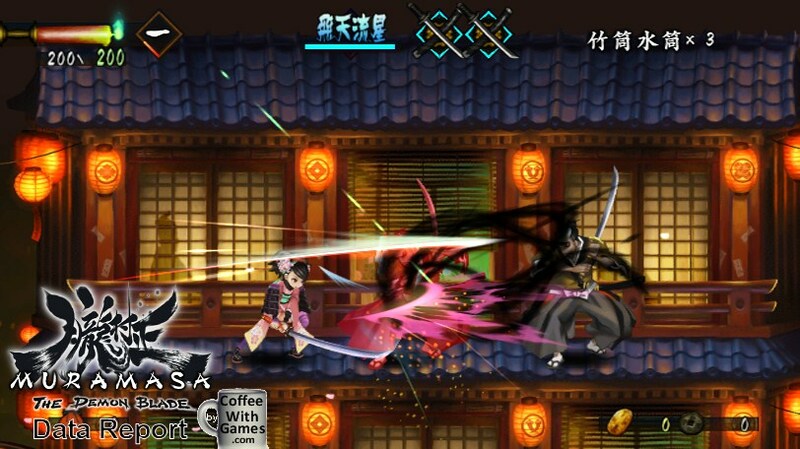 What about critic and customer review score averages for Muramasa: The Demon Blade? The "professional" critic review score average is 81.94%, based on 45 reviews on GameRankings.com. The customer review score average is now 94.28%, based on 98 reviews from Amazon.com. I think the reported average being almost 14 hours "Per person" shows the game was probably played through once, but then not really played again by most players. While the game originally released with a MSRP of $49.99, it can be purchased much cheaper now from sites like Amazon.com and even GameStop.com. Being that I haven't played it, I may need to add this to my "bargain bin" game hunting list and keep a lookout for it considering how high the customer review score average is. If you have played Muramasa: The Demon Blade what do you think about the game? Based on the critic review score average, do you think it was underrated or overrated based on your time with the game? Or, do you not care about the reviews and just think that the game is a must play for any Wii owner? If you played the game did you average about 14 hours on just one play-through, or did you complete it multiple times? I'm still looking for this game to come up for a good price, but it's still going for $40+ around here. I have no problems paying that, but I need money for other things at the moment. A little surprised that more than 30,000 people have played the game since your first report. Guess this is because it can be found at a lower price, but I'm just glad to see people still have interest in the game. Played it. Beat it. Enjoyed the heck out of it! Graphics were awesome! I nabbed this super cheap at a garage sale of all places awhile back, but I still haven't played it. The visuals are excellent - arguably among the best I've seen on the Wii so far. My son sunk some time into it and liked it he said, but he almost never finishes games and this one befell that same fate. On my backlog for the time-being. Very fun and the visuals are a downright treat! "I'm still looking for this game to come up for a good price, but it's still going for $40+ around here." Interesting it's still so high. Is that even the "used" market, or just the new? I don't think it's even being published in the U.S. anymore. Did your time match up with about the average? Or, did you go back to try and complete everything it had to offer? "I nabbed this super cheap at a garage sale of all places..."
I haven't been garage sale shopping in a long, long, long, long, long time. I have been tempted to give it a try, but I think that would require getting a newspaper (or spotting a home-made sign on the road pointing me to it), and we don't do that. "My son sunk some time into it and liked it he said, but he almost never finishes games..."
I'm guessing though, that if you do finish, it will get a review? I'll keep an eye (or two) open for it. That's the plan - to eventually write up everything I play, but obviously given my backlog some things are more timely than others (like my Diablo III review that has been on ice for like a week now and that I only finished a few weeks ago).